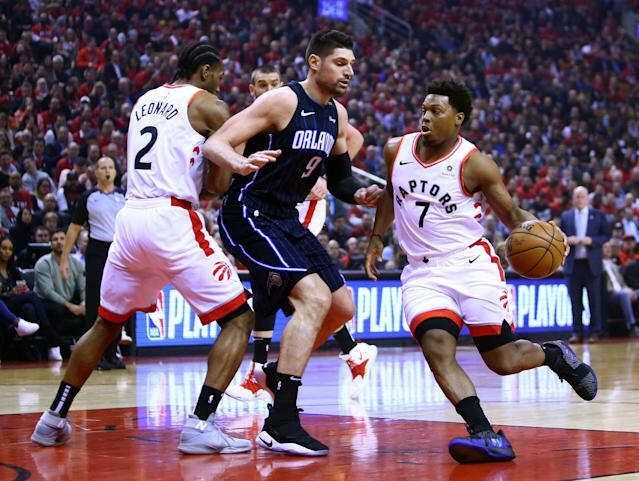 A promising Toronto Raptors season was met with ghosts of playoffs past on Saturday when the Orlando Magic pulled off a stunning upset in Game 1 of their first-round series. It was an abrupt dose of reality in a critical postseason for the Raptors as they look to take advantage of their only guaranteed season with Kawhi Leonard. The result called for a convincing response for Tuesday’s Game 2 in a series Toronto is heavily favored to win. The Raptors got that memo. Toronto cruised to an 11-0 lead to start Tuesday’s game and never took the foot off the pedal in a dominant 111-82 win to tie the series at 1-1. Leonard led the way with 37 points, four rebounds and four assists. But perhaps more importantly, the Raptors got a big game out of Kyle Lowry. The veteran Raptors point guard bounced back from a scoreless Game 1 to post 22 points, seven assists and four rebounds in a game that he and the Raptors desperately needed. Lowry, playing in his seventh season in Toronto, has been on the wrong end of too many disappointing playoff performances that don’t match his All-Star level of play during the regular season. Those playoff letdowns alongside DeMar DeRozan, combined with the availability of Leonard from the Spurs last offseason, prompted the Raptors to retool the team around their new superstar. When Lowry laid Saturday’s egg in a loss, it felt like old playoff times in Toronto. But Raptors fans remained on his side. Lowry made a free throw in the game’s opening minutes to end his scoring drought, drawing cheers from the Toronto crowd. When he hit a 3-pointer to give the Raptors a 14-2 lead, he drew a standing ovation. While Lowry found his stride on offense, the Raptors were stifling as a team on defense, holding the Magic to 37 percent shooting from the floor while forcing 17 turnovers. The series shifts to Orlando Friday for Game 3.